It's been a hell of a long time. Unfortunately, my life drawing group re-located to Wednesday Night, making it impossible for me to attend, and my M&M game broke up, which was a drag. Since then, I've been pretty dry. I've maybe drawn a couple of throwaway pictures here and there, and some doodles and sketches which have amounted to nothing. However, recently, we finally managed to get the old M&M posse back together, which has resulted in me getting back into drawing... which is nice. 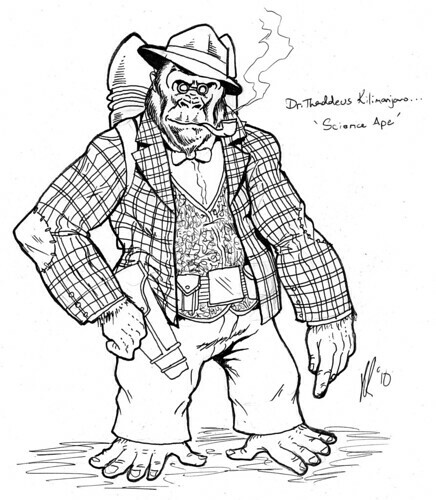 So here's my character, Dr.Thaddeus Kilimanjaro... Science Ape! Last edited by Pól Rua on Sat Mar 02, 2013 1:26 am, edited 2 times in total. 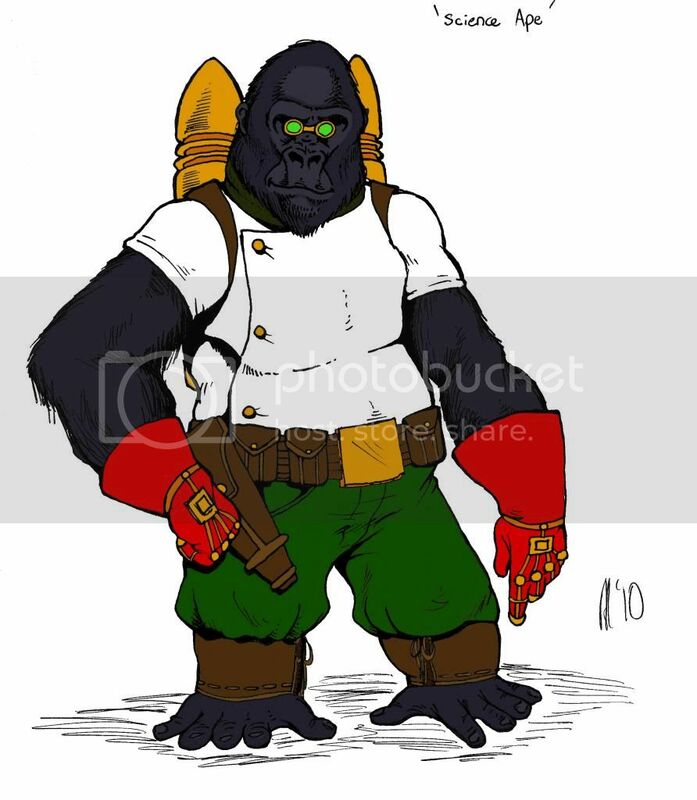 Of course, Doc Kilimanjaro doesn't always wear his superhero clobber. Last edited by Pól Rua on Sat Mar 02, 2013 1:48 am, edited 4 times in total. 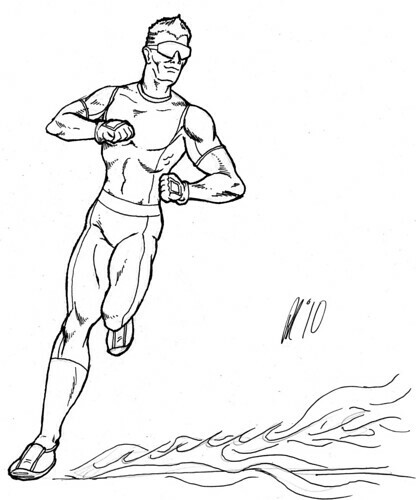 As you can seem I'm really going for a Silver Age vibe with him, and he has a pretty detailed origin story going all the way back to the 60's, when he worked with/and sometimes against a Silver Age 'Flash'-type hero called Molecule Man. The GM wanted us to come up with an arch-villain for our characters. 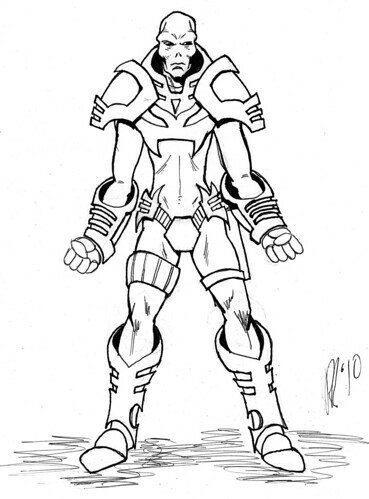 So far, I have only a vague idea of Science Ape's nemesis, but here's a picture of Molecule Man's Silver Age arch-enemy whose backstory is tied to Science Ape and his father, Professor Sebastian Kilimanjaro. Last edited by Pól Rua on Sat Mar 02, 2013 1:55 am, edited 1 time in total. 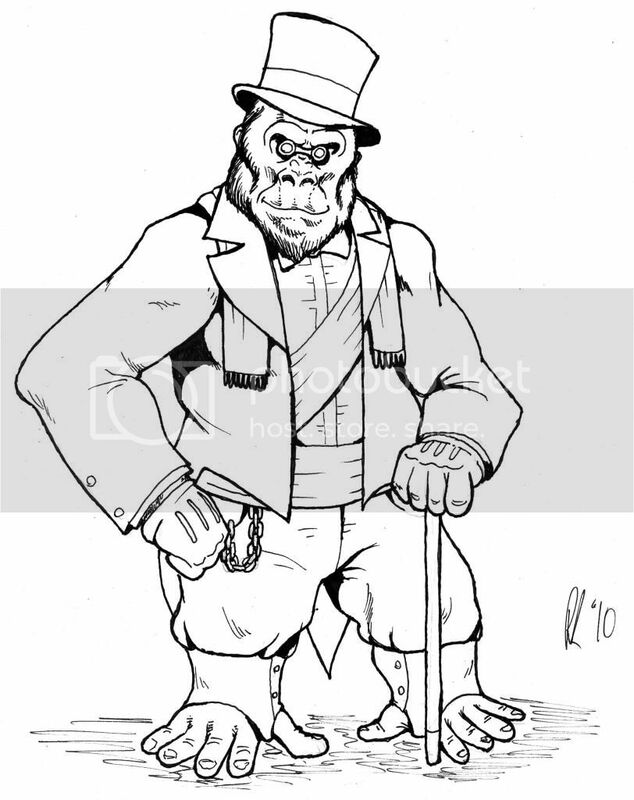 Fine Work, Pol Rua - I particularly like Doc Kilimanjaro! Last edited by Pól Rua on Sat Mar 02, 2013 1:59 am, edited 3 times in total. Here are two of Doc's team-mates, the speedster, 'Blindside', and a character currently tentatively calling himself 'Guitar Hero'. Both of these are rough concept sketches based on the players' descriptions, and I'm hoping to tweak them a bit once they get back to me with more details. Last edited by Pól Rua on Sat Mar 02, 2013 2:01 am, edited 2 times in total. Pol, if it's wrong to have a man-crush on Doctor Kilimanjaro, then I don't want to be right. He is simply too full of epic win to be bearable. I mean, it's been taking all my effort not to just turn him into a kind of paper doll and dress him up in different 'action gear'. I'm also desperately trying to stave off the impulse to try and make myself a Doc Kilimanjaro action figure. Pól Rua wrote: I know! As I look at the four plastic storage crates of 12" GI Joe stuff I had from my 90's binge, I warn you, that way lies madness and poor floor access. 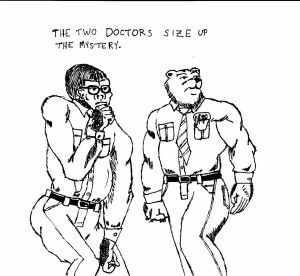 Sorry for having Doc Kilimanjaro "dressed down" for this crossover pic, but I couldn't help it. MorningKnight wrote: Sorry for having Doc Kilimanjaro "dressed down" for this crossover pic, but I couldn't help it. Wowzers! I think that's the first fan art I've ever seen of one of my creations, thanks! As for the Doc, he tends to wear what's appropriate. If he'd been working on a problem for a long time, chances are he'd choose comfort over sartorial elegance. And yet, I twisted his poor arm, and stuck him with a necktie. 'course, it's the collar that's the real discomfort, not the tie itself. Oh man, it's been a LONG time between appearances! I've moved house, my home town has flooded, however, the game is still going on strong. I'm still playing Doc Kilimanjaro, however, I've managed to finish a whole mess of new pictures... which is nice. So here's one or two. First up is The Critic, a.k.a. General Kryddix. He's an interstellar war criminal and Guitar Hero's arch-nemesis. 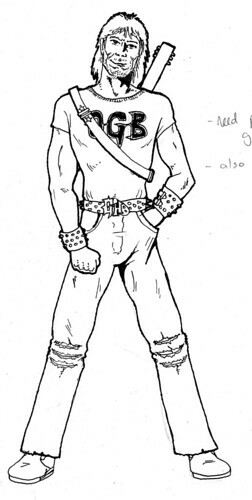 The GM described him as a lizard man (not too lizardy), wearing a bodysuit with high tech armoured plates on it. Next, The Dungeon Master, arch-enemy of Blindside. 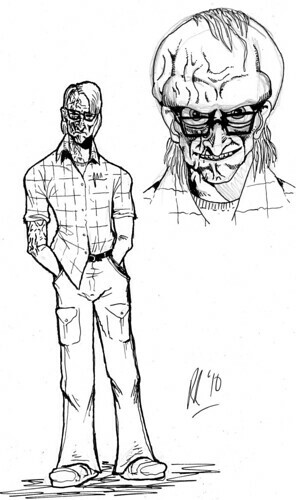 As Blindside was a superpowered jock, his creator decided that his arch-enemy should be a superpowered nerd. Ol'DM has enhanced intelligence, but can boost his intelligence even further, creating the bulging eyes/massive cranium look. At the conclusion of his first appearance, he tried to kill the mayor's daughter by spraying her with acid, but a stray blast punctured the tank and he got the horrific scars you can see in this picture. It was one of those, "Surely, nobody could have survived THAT!" endings.